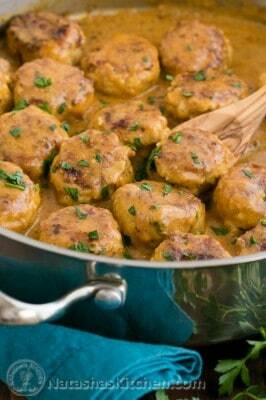 These chicken meatballs are tender, juicy and swimming in a super flavorful creamy sauce that coats each one just so. These are quick and easy and reheat well. In a large bowl, combine ground chicken, 1 cup cooked rice, 1 egg, grated onion, 1 pressed garlic clove, 1/2 tsp salt and 1/4 tsp pepper. Mix well. Roll the meat into 1 to 1 1/4" balls, then roll the balls in flour, dusting off excess. Heat a large skillet over medium heat and add 2 Tbsp oil. Transfer meatballs into the skillet and saute 4 minutes on the first side, then flip them over with tongs, cover and cook another 3 minutes or until golden brown on all sides and cooked through, then remove to a plate. In the same pan over medium heat, melt 2 Tbsp butter then whisk in 2 Tbsp flour and continue mixing until golden in color. Whisk in 2 cups chicken broth and stir until it starts to thicken. Add 1/4 cup sour cream and season to taste. I added: 1/2 tsp paprika, 1/2 tsp sea salt 1/8 tsp black pepper. Bring sauce to a simmer and stir until sauce thickens enough to lightly coat a meatball then stir in the meatballs, turning them to coat (keep in mind sauce will thicken more as it cools). Once the meatballs are warmed up, remove from heat and sprinkle with fresh parsley or dill. Serve warm. I used my own KitchenAid meat grinder attachment and ground up some organic chicken thigh, but if you don't have a meat grinder, don't let that stop you! You can use a pre-ground chicken meat.